Spark goes inside the studio with Victor Cartagena, who draws on memories of El Salvador’s bloody civil war to create a haunting body of work with powerful political messages. Then, backstage with San Jose Taiko on the verge of their 35th anniversary. 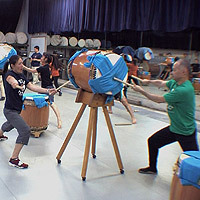 The group’s unique style of Japanese drumming infuses traditional rhythms with world beats from Africa to Bali to Brazil. Finally, watch as Jim Denevan carves enormous, ephemeral sand drawings on the beaches along the Northern California coast. 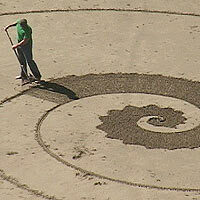 Watch Jim Denevan transform the beaches of Northern California into an expansive but ephemeral works of land art. Lend an ear to the unique rhythms of San Jose Taiko. See how Victor Cartagena draws on memories of the Salvadoran Civil War to create a haunting body of work.